I initially installed ~50mm waste pipe in the eves as conduit with draw strings added using a vacuum cleaner sucking a rag with the string through the pipe. However while I had access to the eves it was easier to run the cables directly into the eves between Node-I and the bedrooms. 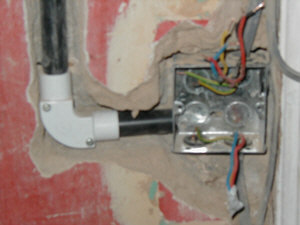 The conduit may be useful for adding more cables in the future as the eves are now filled with insulation and sealed. So conduit may be useful here. Where I used conduit to bring the Idranet cable to a single patress box, frustratingly I found the lips & edges within the conduit inspection elbow prevented easy installation of the cable, the inspection cover had to come off and the cables coaxed around the corner. All the cables to existing light switches are run in 20mm round conduit. 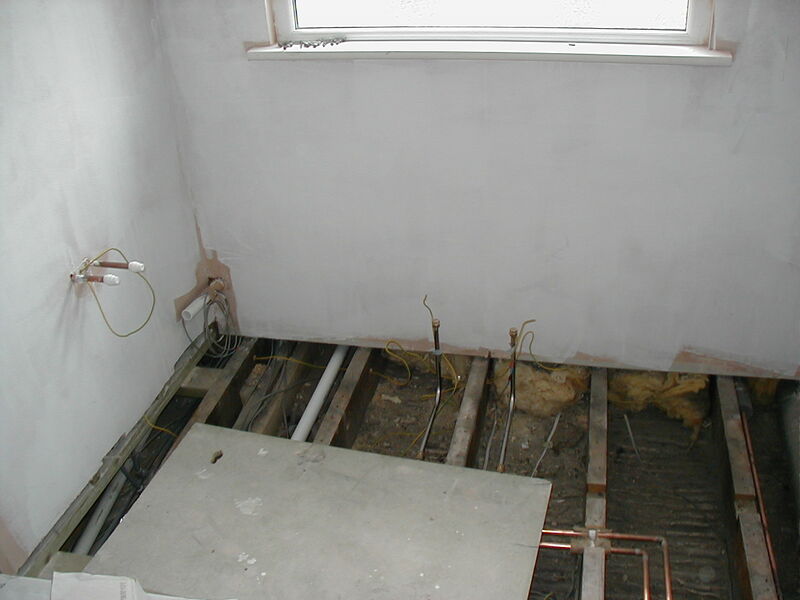 Conduit was also run from floor to back-box in case of some future need in some of the bedrooms. This turned out to be useful as the second relay within the MFP in the bedrooms will be used to control the heating actuator, so cable was run through this conduit at a later date in the installation. A plus for conduit. In this room I ran the door sensor cable as a horizontal T in conduit from the main drop. This was a mistake as it was extremely difficult to pull the cable once fitted with a reed-switch back into the door frame. Vertical drops with a loop across the ceiling to the back-box conduit were used after this; once the reed switch was fitted the slack could be much more easily pushed into the void. Given that I did not find the joints and fittings that are possible with round conduit beneficial I would use oval conduit, if any, in the future. 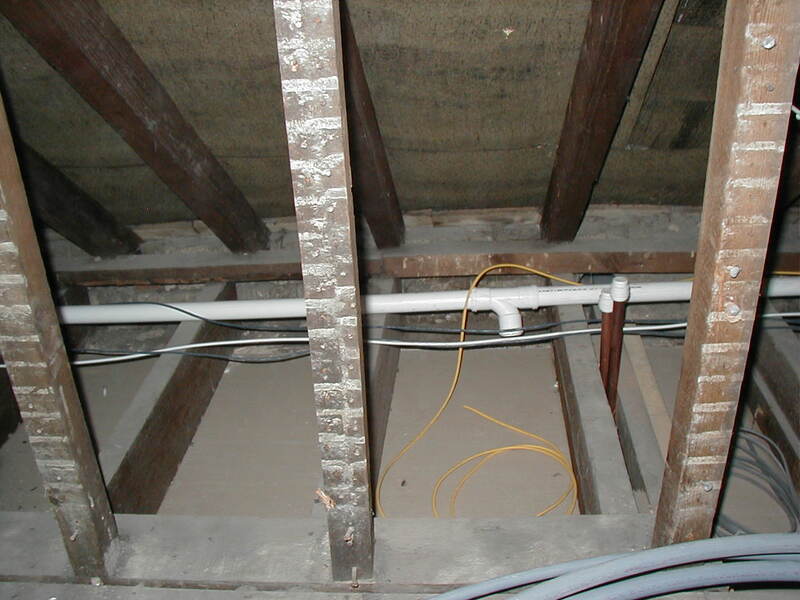 Conduit in the floors was very difficult to install as construction was joist (50mm gap) wall (5mm gap) joist, so there was little room for error in aligning the relatively large and rigid pipe. 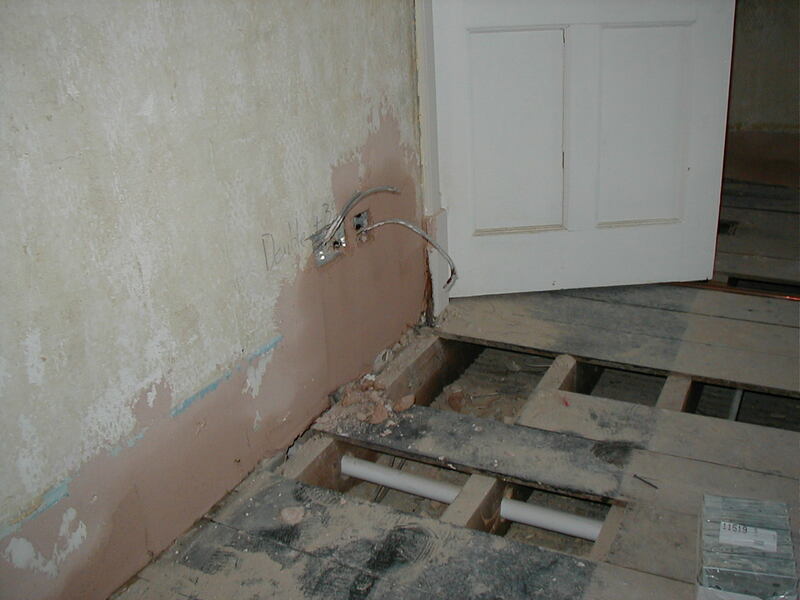 Installation of the conduit obviously required pulling up floor boards and soon after this most of the cables went in. When I returned to install some more cables for the porch area – which I had originally over looked – the conduit was effectively full and another route had to be found. As only one board had to come up along the path across the joists it would have been easier to just pull the board up and drill a series of holes and then thread the cables through each one. So in my experience conduit has been useful in that it has allowed extra cables to be run in some places after walls were sealed. However it was a pig to bury, especially as it was round and I discovered that the capacity of a conduit is much less than the total area of a pipe as teh cables bend and snake and twist as they are installed. I looked up some numbers on conduit capacity and IIRC in commercial settings it is as low as 40% of the conduit area! Plan better and get the cable schedule right first time. Weigh the cost of possibly saving disruption in the future with the certainty of additional cost to bury and route conduit. Ony use oval conduit in walls. This entry was posted on Sunday, November 12th, 2006 at 8:35 pm and is filed under Home automation. You can follow any responses to this entry through the RSS 2.0 feed. You can leave a response, or trackback from your own site.